Liberty is the basis for the only true morality. After my Brother-in-Law passed away, I was asked to take the pictures I had of him and that others sent and make a video set to some music requested by his family. This is the result. I think it shows Mike’s life was rich in love and family. He will be missed. Once again the site has been redesigned! Hope you like it. On Wednesday night last week, Nov 3rd, I lost my dogs. I have two dogs. They are named Emma & Bailey. 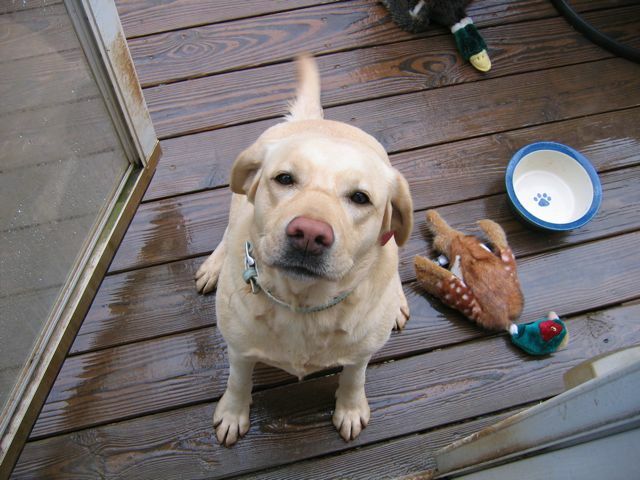 Emma is the youngest; she is a yellow lab about 5 years old and has a sweet and excitable nature. 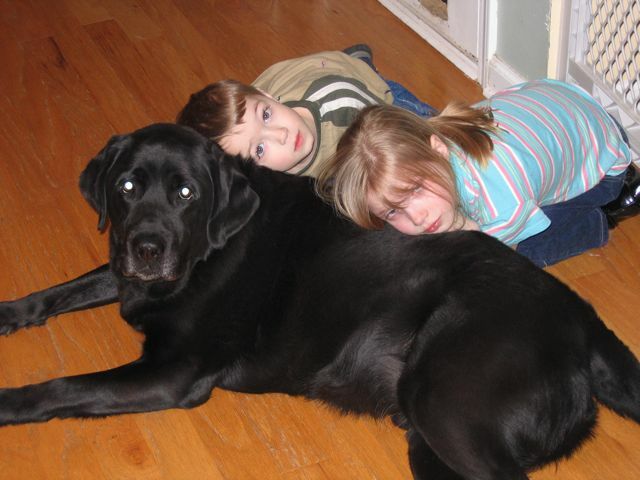 Bailey, my old man, is a black lab has some grey on his chin and is the calm to Emma’s enthusiastic nature. They both love us very much and we love them too. Nancy had gotten them some more food and it was too large for her to carry in from the car so I went to get it. I emptied it into the food bin while Nancy went to fetch their dishes. We had not been able to feed them a complete meal earlier in the day because we had ran out. As I am waiting for the dishes so I can fill them with food, I hear my wife exclaim that they are not in the yard. I went out in my car looking for them. It was 9:30pm and pitch dark outside. The chances of seeing the dogs was slim but I couldn’t do nothing. I guess I was out for an hour when I gave up. I went to bed worrying about them. I was thinking: “What if they were hit by a car?”, “What if Bailey was hurt and Emma would not leave him?”, “What if someone found them and took them for their own?”, etc. What made matters worse was they had gotten out without their collars. Emma seems to get her collar off pretty easily. Her neck is thicker then her head. Bailey lost is tag on his so even if he had had it on, he would not have been identifiable with it. We usually keep them on. The next morning I went out again. I woke up at 5:30a and could not get back to sleep from worry. So I searched for another 45 minutes. I finally decided I was not doing them any good by driving around. I headed home, cranked up Pages, and created a flyer. Then I sent the flyer to the UPS Store near my house to be printed 50 times and started getting ready for work. Nancy & Chelsea put up the flyers that afternoon. I drove to the Cobb County Animal Shelter after work. I met a young man there who I thought was working there but turns out he was just a frequent visitor to the place. He helped me find the right people to talk to. They were very helpful but I did not find my dogs. Before I left he took my name and number and told me he’d keep an eye out for 2 labs matching my dogs’ description. I was struck by how willing to help a complete stranger these folks were. Later that night, one of our friends saw the flyers we posted, and called my wife not realizing that the number on the flyer was hers. She had seen our dogs at a local Texaco station and has seen a lady who was trying to take the dogs in hand. So we went to the Texaco with our flyer and asked if we could post it. The attendant gave us permission and said he had seen our dogs too and that a lady had taken them. We hoped that she might check back in the area to see if any flyers had gone up. Sure enough she did check back and the next day my wife got the call that our doggies were safe and sound at the Mostly Mutts Animal Rescue. The lady who had taken our dogs from the Texaco took them strait over to Mostly Mutts. So while I was out driving the streets of Kennesaw looking for my puppies, they were safe and sound in a well equipped animal rescue probably having the time of their lives getting all kinds of love and attention. Kennesaw used to be a small town. When I moved here in 1997 it was already getting bigger. In the past 13 years it has gotten quite large. There are so many people. Sometimes it seems like no one knows anyone else. This is not true. We are connected in so many ways. We are connected by relationships and by the places and businesses we visit. Those connections led us back to our doggies and I am so glad and thankful for it. I never want to go through losing my dogs again but I am heartened by the fact that when I did, my community helped me. I try to be the type of person that exhibits uncommon courtesy, generosity, and honesty. Either I got VERY lucky or it is not that uncommon. More the better. This is a sad day for us Disney fans. Roy Disney has passed away at the age of 79 after a bout with cancer. http://www.cnn.com/2009/SHOWBIZ/12/16/roy.disney.obit/index.html. I remember, in recent years, seeing interviews with this man. In particular one about the creation of the Animal Kingdom Lodge. His excitement for the property and his enthusiasim for the company was inspiring. I stayed at the Animal Kingdom Lodge shortly after watching that and I was blown away. Rest in Peace, Roy Disney. Kouzzina by Cat Cora opens at Disney's Boardwalk! Just saw this over at DISUnplugged.com. Looks really nice but not that different, in appearance, than Spoodles. I think the kitchen got the biggest make over. All that shiny stainless steel and copper looks great. I actually really liked the food at Spoodles but I am really looking forward to trying Kouzzina. I called WDW Dining to check this because when the restaurant was announced I had heard that it would be a “Signature Dining Experience”. Which, if you are on the Disney Dining Plan would require the expenditure of 2 table service entitlements. However, I was told today by WDW Dining ( 1-800-WDW-DINE ) that the restaurant would require only 1 Table service entitlement. We usually get the DDP when we travel to Disney so that is a plus. I was afraid that they were going to put two “Signature Dining” restaurants right next to one another ( The Flying Fish Cafe is a “Signature Dinging” restaurant. ). The only thing missing from the Boardwalk is a counter service option. That was one of the most inconvenient things when we stayed at the Boardwalk and had the DDP. We tried to spend the day at the resort but had no way to use our DDP to get lunch. We ended up heading to Earl of Sandwich at Downtown Disney, if I recall correctly. I just finished reading this story over at FoxNews.com. What a sad thing. I always felt that Disney did a great job with safety. I wonder what will come out as the cause of this. Unfortunately, it will probably be ruled operator error. Apparently this was the first fatal accident in the Monorail’s 38 year history. What a sad day. My thoughts go out to the family and friends of the man who died and to those who were injured. A couple of weeks ago I was heading out of work. The building I work in has a separate elevator for the parking deck and I always park on the 6th floor since sometimes I get in late and I don’t like to have to remember what floor I parked on. There’s always spots available on 6 so I always park there. I get into the elevator for the parking deck. I am listening to my book, Pawn of Prophecy (The Belgariad, Book 1) by the recently deceased David Eddings. As the elevator rose I felt a lurch and the elevator felt like it dropped a few inches and then it stopped moving. My heart was in my throat and pounding a mile a minute. I waited a moment and when the elevator did not start again, I pressed the call button. The security station down by the front doors answered my call. The charming lady on the other end of the intercom was reassuring and told me that they were sending some of their maintenance people to try to get me out and they were calling the Otis folks. I guess if you are going to get stuck in an elevator this one is not that bad. I work in the Ravinia 3 building near Perimeter Mall in Dunwoody, Georgia. The grounds are beautiful. There is a Crowne Plaza at the front of the property and the area between the Crowne Plaza and the office buildings behind it is landscaped with paths and a small pond. It really is one of the nicest office complexes in the Atlanta area. There are also gardens in the atrium which is a large area enclosed in tinted glass between the main Ravinia 3 high rise and the parking deck. The elevators have a glass back and look out over these gardens with a water feature that ends in a water fall that falls into a pond that surrounds the base of the elevator shafts. I settle in for a wait. The maintenance guys are unable to get the doors open. I am stuck between the 2nd and 3rd floors with the top half of the elevator door opening to the third floor. It took quite some time to get someone over there from the service company in the middle of rush hour on a Friday evening. Eventually they got the door open. Now, I am a large person. There was no way for me to climb out of this elevator. As I said the top part of the door was open to the third floor but it was just under shoulder high for me. I handed my bag up to the men helping me out but did not see how I was going to climb out. Then one of the men jumped down into the elevator, crouched down, and said “Step on my back, I’m stronger than I look”! I hesitated. It feels wrong to step on someone. The idea of it just seemed like I was disrespecting him. I quickly reasoned that I was disrespecting him by rejecting his gallant assistance. So I quickly stepped on his back and the other men helped me pull myself out. After getting out, I went to seek the lady who checked in on me every so often over the intercom to let her know I appreciated her attentiveness and kind words. All in all, I learned something about the men and women that are the support staff at Ravinia 3. While I never disregarded or disrespected them I certainly did not notice them very much. That may be by design. They stay unobtrusively out of the way until they are needed. When they are, they jump to their duty and perform it with courtesy and professionalism. I think we can all strive to have just such a work ethic. Those men and women deserve my thanks and everyone’s respect. We went out to my dad’s place on Sunday for Father’s Day. We were hanging out. Dad had bought some hamburgers and hot dogs and I cooked them on his grill. They were great. My Sister, Jessica, was there. After diner the kids asked Dad to take us out on his boat. We grabbed some fishing rods, just in case, and headed out the back door to his boat slip. Dad has a nice boat but we put too many people on it. It started taking on too much water. So we headed back to the dock. Jessica had to get going anyway so Nancy & Her went back up to the house and Dad took the kids and I out to an Island he likes to picnic at. After that, we headed across the cove and dropped our lines in the water for a little fishing. 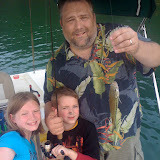 We really did not expect to catch anything. After just a few minutes Adam’s bobber goes down and I am giving him a crash course in bringing in a fish. This was his first time fishing. We brought in the fish and it was too small to keep. Unfortunately, the fish had swallowed the hook and he probably died after we put him back in the water. This was originally posted on MouseOwners. I had planned to do this while in the world but I just didn’t find time to sit down and write them so here I am the day after driving back and I will give you folks a report. On Friday May 22nd we drove out of Atlanta very late. We wanted to leave by 3:30 pm but didn’t actually leave until 6:00 pm. We were heading for Ocala, FL and the Holiday Inn & Suites Hotel there. We have done this the last few times we have gone and it has worked well for us. This way we’re not spending points to stay over in a hotel room that we will be getting into at 12 or 1 am. The kids slept in the car and we got in around 1 am. The Ocala Holiday Inn is a terrific property. The lobby is beautiful and they have a asian fusion restaurant on the top floor. For those traveling down I-17 to WDW, I definitely recommend a stop over here. On Saturday morning we get up and have breakfast at the Bob Evan’s right down the road. I love that place and there are none in Georgia so we had to eat there. There’s nothing like Bob Evan’s Gravy on their Biscuits! After breakfast the car informs us that the coolant level is low. Luckily there’s a BMW dealership on the road near the Bob Evan’s and we go over there to have them look at it. They top off the the coolant level and we’re off to WDW. The trip from Ocala takes about 1.5 hours. We arrive at AKV at around 2pm. The lobby at Kidani Village is like Jambo house in miniature. Decorations are beautiful. The animal observation peninsula is smaller but still allows a great view of the animals. The villa is beautiful. It was exactly as the model was at SSR but this time there were REAL animals out the window. The kids have made it clear that we MUST go to the pool as soon as we get to the hotel and we do. The weather is overcast and predicted to be scattered thunderstorms all week. However, the pool is beautiful. The zero depth play area was fun for my DD11 and DS7. I enjoyed using the water guns to spray them. The pool is not huge but it is nice and the slide is great. We spent the rest of the afternoon in the pool. 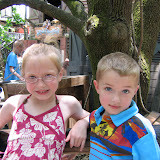 Later that night we had reservations at Whispering Canyon Cafe and so we headed there. We loved it and the CMs really did a great job acting the part. We did not ask for Ketchup but a couple of tables near us did and it was hilarious. If no one asks for it, it is worth asking just to see what happens. It was memorial day weekend so there were tons of locals as well as tourists at the parks. TouringPlans.com predicted a 9 for Monday and an 8 for Saturday and Sunday. So we decided not to go to the parks until Tuesday and Wednesday. That meant we had another day at the pool on Sunday. This was also my DW & I’s wedding anniversary and we had reservations at Sanaa. So after the pool we went back to the hotel room and got ready for our night out. Sanaa is a terrific restaurant. The food is significantly influenced by Indian Cuisine. My DW and I go to Indian restaurants a lot. It is one of my favorite types of food. We thoroughly enjoyed it. The food was spiced perfectly. We started with the Indian Bread Service. We choose the Naan, Roti, and Paneer Paratha and for the sauces, Mango Chutney, Roasted Red Bell Pepper Hummus, and Tamarind Chutney. The Paneer Paratha was my favorite, the Naan was a little more crispy then I have ever gotten in an Indian restaurant and the Roti was really just a tortilla. The sauces were all great. The Tamarind Chutney was very authentic. We both had “Slow Cooked in Gravy” selections. I had the Beef Short Ribs and the Shrimp in Green Curry and DW had the Beef Short Ribs and Chicken with Red Curry Sauce. The Beef as tender and seasoned perfectly. The Shrimp were spicy but I like that and they were cooked perfectly and the Chicken was good but we both agreed the Shrimp and Beef were the best. I will have to go back and try the Tandori Lamb. For desert we had the Cardamom-Butter Cake and the Chai Cream and, because it was our anniversary, they brought us some chocolate cake. I enjoyed the Cardamom-Butter Cake but felt it was a little dry. The Chai Cream was refreshing and delicious. If you like Chai you will love this. A very nice light ending to the meal. The chocolate cake was moist and delicious. On Monday we had a lazy day. We went to Downtown Disney and had lunch at Wolfgang Puck’s Express. The chicken is terrific. Then back to the hotel to hit the pool. Only the weather did not agree and they closed the pool just as we arrived due to lightning. So I took the kids to the arcade and we blew $20 playing games. We had reservations a Jiko that night so we went back to the room and got ready. We have gone to Jiko many times over the last few years and every time the meal was wonderful. This was no exception. I had the Roasted Lamb Loin, DW and DD11 had the Oak-Grilled Filet Mignon. On Tuesday we went to Epcot. DD11 and DS7 like Epcot better then any other park. The first thing that they have to do is Spaceship Earth. No matter how many times I do that, I still like it. Then it was off to the Land to get FPs for Soarin’. Well we got there too late and there were none available. The wait was 75 minutes. I figured if there were no FPs left we’d have to wait 75 minutes to ride anyway so we should just bite the bullet and do it. But DW, did not want to wait. So we did “Living with the Land”, which I always enjoy and left the Land but as we were leaving a thunderstorm came up. So we turned around and went back inside. So we decided to go ahead and wait for Soarin’. By the time we got in line it was clear that many others had the same idea and the wait had climbed to 100 minutes. Still, we figured that we were better off waiting there then walking around in the rain, even if we did have ponchos. So 2 hours later we walk off of Soarin’. I love that ride, and think it is worth the price of admission all by itself but the DW is a little grumpy at the waste of time. So we head off to World Showcase to check out a few of the countries before our diner reservations a Restaurant Marrakesh. This was the first time for us to dine at Restaurant Marrakesh and we really enjoyed it. I spent my childhood living in Saudi Arabia so I was looking forward to some food that was at least similar to what I had there. I was not disappointed. I had the “Taste of Morocco” a 4 course meal with soup, appetizer, entree and dessert. The soup and appetizer were terrific. The entree was a combination of Cous Cous w/ Vegetables, Lamb Shank, and Lemon Chicken. All of it was delicious. The Chicken was cooked perfectly, the Lamb Shank as falling off of the bone and the Cous Cous was seasoned nicely. The desert was a selection of baklava and was equally delicious. After diner, it was time for Illuminations. It was raining but we had ponchos so we stood out there to watch it. The rain had chased most people inside so we got a really good view. I simply refuse to use an hour of my time camping out for a view of a parade or fireworks show so we usually have to stand back a bit. This time we were right at the edge of the World Showcase Lagoon. After that it was extra magic so we stuck around to do a few more things. DW hates roller coasters so I couldn’t get her to go on Test Track and I wasn’t going to make her wait while I did it. So we headed back to the Land to do Soarin’ again. This time the wait was only about 25 minutes. Next we went to do Spaceship Earth again and went home around 11pm. On Wednesday, we went to Hollywood Studios. The main thing we wanted to do while we were there was The American Idol Experience. So we went to it first. It was easy getting in to see the show. The contestants were pretty good, especially this one young lady. The judges were cliches. I thought their attempt to match the Randy/Paula/Simon formula was somewhat cheesy. Still it was fun to watch and girl I voted for won. We thought about trying to come back for the finale at 7:00 but that was when we had diner reservations at Hollywood & Vine. After that we watched the Indiana Jones Stunt show, I always enjoy that. Then my DD11 and I went on Star Tours. Now it was time for our reservations at Hollywood & Vine. The food there was terrific. It reminded me of the food at Crystal Palace and I love that place. After that we wondered around did the Great Movie Ride, visited some shops and made our way over for Fantasmic. That’s when we took a closer look at the times guide and realized they weren’t doing it. That was the main reason we had stayed for extra magic so we decided to go home. On Thursday we were scheduled to check out and head up to HHI. However, the engine light on the car’s dash turned on the night before as we were leaving Hollywood studios. I called a BMW dealership and made an appointment and drove up there leaving DW, DD11, and DS7 to pack up and check out. While I waited in the Dealer’s plush lounge eating quesadillas and drinking their fountain drinks. DW has dealing it a fiasco back at the Hotel. The dryer in our nearly brand new villa was not working and we had a load of wet clothes that just were not getting dry. She calls the front desk, which, BTW, isn’t actually the front desk, and is told that they will send someone. No one shows then she calls again and they say that they will have the manager call her, but he never does. Then she calls back again, and they say she should use the laundry room’s dryers, a good idea, so she head down there. Finally she talks to a manager and he apologizes for the inconvenience and actually puts a $50.00 credit on our credit card. In the end, she finally leaves the room around 2pm and has them store our luggage while we wait for the car to be fixed. In the meantime they head to Downtown Disney and get lunch at Earl of Sandwich. BMW finishes with my car around 3pm and I meet them over at Earl of Sandwich and have a Full Montagu. Now we always have a ton of Snacks left over from our DDP. We just don’t use them when we are in the parks for some reason. So I tried to get one of those Ice Cream Sandwiches at Earl of Sandwich with my snack and the lady tells me that they are not on the Snack program and never were. However, I know I got them more than once as a Snack last year and the year before. Does anyone else remember using the DDP snack coupon on those ice cream sandwiches? After finishing up there we head to Goofy’s Candy Shop to spend the rest of our DDP snacks ( we have 13 left ). Then it’s out to HHI. The drive is supposed to take about 6 hours. DW is a VERY fast driver. So we do it in about 5 hours drive time. However since we had to stop for diner and there were a few construction zones along the way, it ended up taking a total of 7 hours. We left at 6pm, so we did not get to HHI until 1am. I really like HHI. The place is so peaceful. The villas remind me a lot of the ones at OKW just with different decorations. We got a 1 bedroom villa in the Inn building on the top floor. The view was of the marsh and Shelter Cove. On Friday we got up late and went out for a late breakfast. We had gone to the Hilton Head Diner on our last trip and remembered the food being good so we went back. What a mistake. The place seems to have changed ownership. The hostess was surly when DW asked for a booth. The waiter was sort of grumpy. I ordered the Cornedbeef Hash. This had to be one of the most revolting things I have ever put in my mouth. I sent it back and got some eggs with bacon and homefries. The food was just barley OK. We left without leaving a tip. Do not go there. In the afternoon we relaxed at the pool. When we went back to the room I made some Mojitos with some ingredients we had bought earlier after breakfast. Then we went for an early diner so that we could be back for the Campfire at 8p. We ate at Kingfisher’s right across the bridge from the resort. DW had Talapia Grab Au Gratin. WOW that is a nice dish. I should have gotten it myself. I had the Fried seafood trio. The fried scallops and Shrimp were incredible. The Fried Cod was not so great. The did not cook it long enough so the coating was doughy. I definitely recommend the place. So we head back to the resort and went to the campfire but since there were thunderstorms in the area, they did Goofy Bingo in the community hall. That was fun but we were disappointed that there was no fire and, therefore, no S’mores. So we headed out to Cold Stone for some ice cream. On Saturday, got up late again and had a late breakfast at Stacks. This was much better then Friday’s breakfast. The food was terrific. The eggs were cooked perfectly, the bacon was crispy and the Homefries had something in them and were some of the best I have ever had. And, with a name like “Stacks”, the pancakes were incredible. After that we headed to the beach. The beach house was not a simple to find as the maps they give you imply. If you decide to drive over make sure you don’t assume that a strait line on the map in any way implies a strait line in reality. Still, the ride was short and we found it OK. The beach was nice. The kids really loved it. We played in the surf then we went up to the pool at the beach house. DW and I had a drink and the kids played in the pool. For diner we went to Bonefish. This restaurant is terrific. DW and I both had the Sea Bass with the Pan Asian sauce. The fish was flaky and the sauce was delicious. Also the Infused Margarita was incredible. On Sunday we went home. On the way we stopped off in Savannah and had lunch in City Market at the Cafe at City Market. DW had the Blackened Grouper Sandwich. The grouper was cooked perfectly and the backening seasonings are very authentic. I had a burger which was very good. The drive from there back to Kennesaw only takes about 3 hours and was uneventful. As you can see the look and feel of the site has been redesigned. I am looking at other theme options but for now this is the one I have settled on. Let me know what you think. I am trying to figure out the best way for my family to enjoy Disney World's parks spending the least amount of money. Since we live in Atlanta it really isn't hard for us to get down to Orlando. Also we usually spend about 5 nights in WDW and then head to one of the Disney Vacation Club resorts on the coast, Disney's Hilton Head Island Resort or Disney's Vero Beach Resort, for the remainder of the week, 3 nights usually. Therefore we really only need, max, 5 days worth of the parks depending on what we do the day we arrive and the day we leave. Our next trip is planned for May 22 - May 31. We will be staying May 22 at the Holiday Inn & Suites Ocala Conference Center Hotel. This is a wonderful property, I definitely recommend it. We arrive in WDW on May 23rd and will check out May 28th. We are staying in the new Animal Kingdom Villa's Kidani Village. Then we will head to Disney's Hilton Head Island Resort for May 28 - May 31. The "Per Year" line is calculated with the assumption that we would be buying an annual pass only every other year and staggering our vacations so that we can use them on the vacation when we buy them and the next one. We only take one a year, usually, so this would work out pretty well. My favorite holiday of the year is drawing near! We are having Thanksgiving at my place this year. Unfortunately, Donley, Leah, & Kids are not going to attend as they will be seeing the Yama side of the family this year. I hope they have a terrific Thanksgiving. This year we will be 8 for diner: Dad & Martha, Jessica & Dave, Nancy, Adam, Chelsea, and Myself. I am planning the normal selections: Turkey, Dressing, Nancy's Mac & Cheese, and something with green beans. Jessica is brining her wonderful Sweet Potato cassarole. And I am not sure what Dad is bringing. If anyone has any suggestions for the Dressing this year or will being bringing anything extra, please leave a comment. It is my birthday today! I turn 40 today. Donley and I decided it would be best to move Thanksgiving to his house. So Donley will be making the Turkey, Gravy, and Mashed Potatoes. I think Leah will be providing her Pecan tarts, mmmmmm. I will bring a Pumpkin Pie, some Bread Pudding, and Stuffing. Nancy will make her Baked Mac & Cheese. Jessica is bringing her Sweet Potato Casserole and Squash Casserole. Dad and Martha are bringing Deviled Eggs and Martha’s Wonderfully Delicious Egg Rolls. Sounds like a great feast. 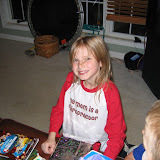 We celebrated Chelsea's 10th birthday with Dad, Martha, and the rest of the family, except David :-(. Chelsea really enjoyed everyone coming for her party. Please add, as a comment, what you are planning on bringing. This was a great trip! We stayed at the Animal Kingdom Lodge. Wow! what a great property! 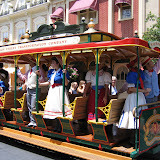 I just put this album together the other day even though it is of our May 2007 trip to Disney. Have you noticed we are Disney freaks?!? I took this picture right before we left for Disney World for Chelsea’s birthday. Wow, doesn’t Nancy look great! We had Chelsea’s birthday party yesterday. Just family. Dad, Martha, Donley, Leah, Oliver, Lily, and Jessica were all there. I made spaghetti and meatballs. It was a hit! I was worried about the meatballs. I thought I had left them in the oven too long ( yes, I do them in the oven ). Turns out they were still really juicy and tender. I just hate it when meatballs are big dense dry lumps of meat. The sauce was good too. I made it quick from canned tomatoes. The recipe follows. Chelsea got some nice presents, of course, the trip to Disney World was the biggest present she got. I picked up her new bike last night. It’s a pink Diamondback with tassels and a little bag that attaches to the handle bars. I will post a picture. Mix all ingredients except bread crumbs in a large bowl. The best tool for this is your hands but, If you prefer you could use a large rubber spatula to cut the ingredients together. The key here is not to mash the ingredients. Keep the mixture loose. Cover mixture and place in the fridge for at least an hour. Form balls by scoping a consistent amount into your hands. I used a #50 spring loaded scooper to scoop out heaping scooperfuls. Form the balls by rolling in your hands. The trick here is to make sure not to press the mixture together. Also a small amount of water on your hands can help prevent the balls from sticking. Place the bread crumbs in a bowl and dredge the balls in it. I like to use a handled soup bowl. Then I can put the ball in the cup, holding the cup by the handle, I then rotate the cup so that the ball rolls around in the crumbs. As you bread the balls, place them on the backing sheets. I got 41 balls out of this mixture. Bake in the oven for 15 minutes, or until an instant read thermometer reads 160 degrees Fahrenheit. 8 oz. Mushrooms ( baby bellas are good here ), diced. drain whole tomatoes through a fine sieve and reserver liquid. chop tomatoes cutting off the stem end ( not good eats ). Add enough of the reserved liquid to the tomatoes to equal 6 cups. Heat oil in a large non-reactive pot ( I love my enamel coated cast iron ) over med-high heat. put in the diced mushrooms. They will release some water as they cook, keep the heat up so that this water will dissipate. Saute’ until soft and browned. add garlic and tomato paste. Cook for about 2 minutes. Add tomatoes and liquid, and crushed tomatoes. simmer for about 30 minutes or longer if you like. I am pleased to announce that this website has Launched today! 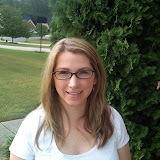 I will use this website to blog about various issues, post family information, and photos. PS. Thanks to N.Design Studio and salle for this terrific theme. See their links at the bottom.